First start by peeling and slicing the parsnips in to approximately 1 inch cubes. While you’re slicing the parsnips, save about a half parsnip to the side, not to be added to the mash pot. Put the parsnips in a large pot to boil. With the parsnips in the pot, pour water in until it is just covering the sliced parsnips, and turn on the heat to high. While this is heating up, peel and slice the sweet potatoes. Add them to the pot, and top off the water, so that it is again just covering the sweet potatoes. Now dice the ginger, and add to the pot. As soon as the pot begins to boil, turn the heat down to a simmer. Let simmer for at least 40 minutes, stirring occasionally. Now add that last half parsnip, chopped finely, to a small simmering pot and add water until it’s just covering the parsnips, like in the other pot. This pot should be on low heat, and stirred occasionally. While you’re waiting for the mash to cook down, prep the bacon for cooking. Chop the bacon in to 1/2 inch pieces, or slightly smaller. Put the bacon in to a large pan with a lid; using the lid helps to ensure that your bacon ends up chewy, which is just right for this dish. Turn the heat on to about a 3 on a scale of 1-10, or half way between low and medium, and cover, remembering to stir occasionally. The bacon should take about 10 minutes, so start the bacon after about 30 minutes of cook time on the mash. Once the sweet potatoes are falling apart, begin stirring more often, and vigorously. This should start around 25 minutes in to the simmering, and just before you should start the bacon. Allow to boil down for another 20 minutes, stirring regularly and vigorously, to a thick mash of a similar consistency to your desired end result. 40 minutes of cook time for a thinner mash, and up to 50 minutes for a thicker mash. Remember, it is hot now, so it will thicken more as it cools. Turn the heat off and let cool for a few minutes, then add the coconut butter and get the masher and mash right in the pan. 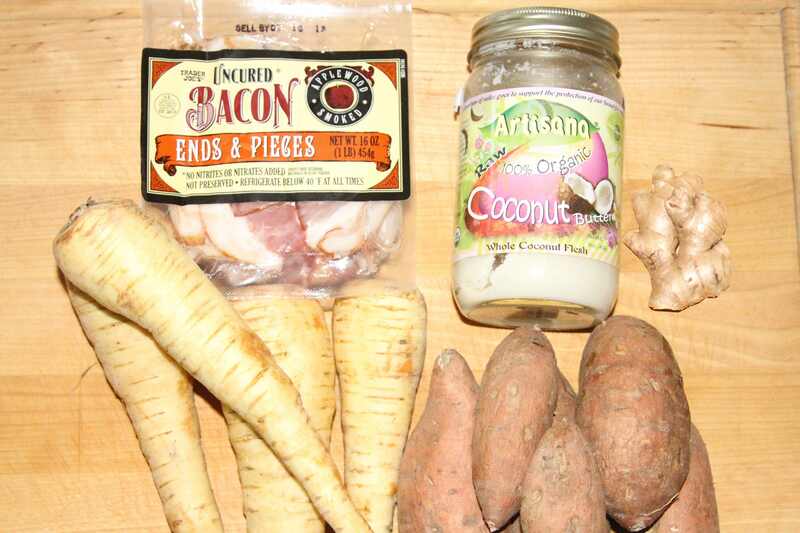 Once you’re done mashing, add the last pot of parsnips and the coconut butter, and stir the mix up. Notice the finely chopped parsnips add a color gradient to the dish? It won’t affect the taste, but the color is quite nice. Now, add the final mixture to your serving bowl, and put the cooked chopped bacon on top. Your Urbanpaleochef Macon Mashed Sweet Potatoes dish is now ready to serve. This is an Urbanpaleochef original, so I really hope you love it! 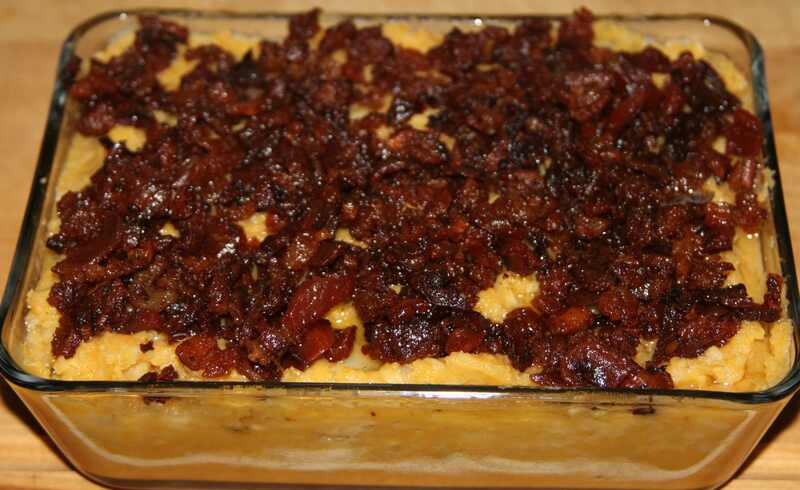 This Bacon Mashed Sweet Potatoes recipe is about the best mashed potatoes you'll ever eat!! Peel and slice the parsnips to 1 inch cubes. While your'e slicing the parsnips, save about a half parsnip to the side, not to be added to the mash pot. Put the parsnips in a large pot to boil (you'll be adding the sweet potatoes to this same pot): with the parsnips in the pot, pour water in until it is just covering the sliced parsnips, and turn on the heat to high. While the parsnips are heating up, peel and slice the sweet potatoes. Add them to the same pot, and top off the water, so that it is again just covering the sweet potatoes. Dice the ginger, and add to the pot. As soon as the pot begins to boil, turn the heat down to a simmer. Let simmer for at least 40 minutes, stirring occasionally. After 30 minutes of cook time, chop the bacon in to ½ inch pieces, or slightly smaller and cook on medium-low head in a large pan, covered. After 40 minutes cook time start cooking that last half parsnip in another pot, chopped finely. Cook on low heat, stir occasionally. 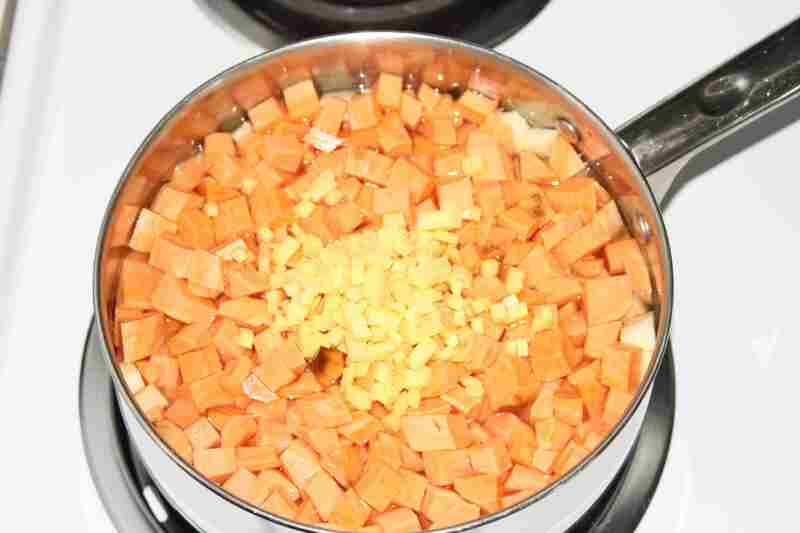 Once the sweet potatoes are falling apart in the pot, begin stirring more often, and vigorously. After at least 60 minutes of cook time (up to 40 more minutes for a thicker mash) turn the heat off and add two tablespoons coconut butter. Mash by hand right in the pan. Once you're done mashing, add the last pot of parsnips and the coconut butter, and stir the mix up. Add the final mixture to your serving bowl and spread the bacon on top. 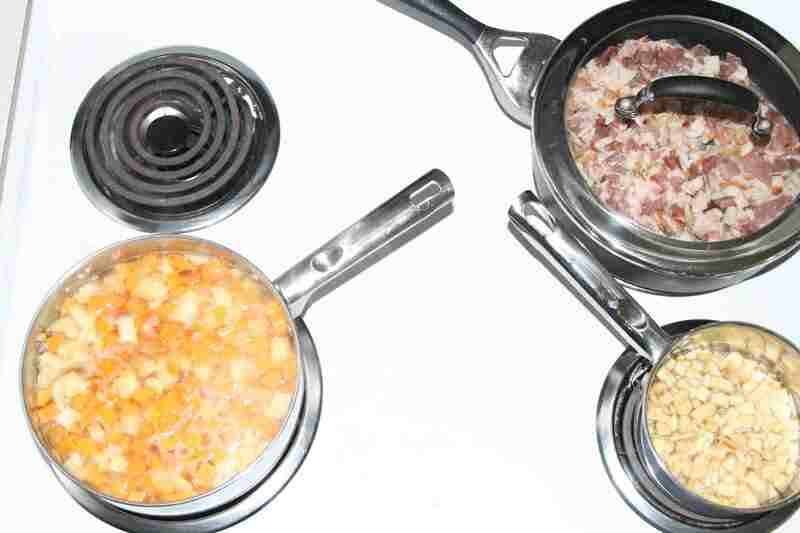 The cook time can be significantly shortened if you strain and puree the potatoes after boiling to soften. I prefer to do as much of the processing with natural cooking methods as possible; I believe that the end result is noticeably better. But there is something to be said for brevity! If you like a thicker mash, you can boil it down more after it has been pureed (or after the sweet potato really starts falling apart in the pan, as I do it). This can be done for another 20-40 minutes, depending on how thick you would like your mash to be. such a genius recipe!! i used white sweet potatoes and apples in the puree and it came out great! O! M! G! What a freakin’ awesome idea!! I love it!!! !